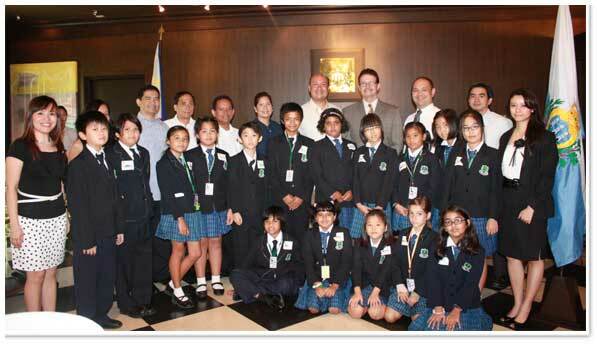 April 13, 2010 - Honorary Consul General of San Marino to the Philippines Jean Henri Lhuillier welcomed to the consular office selected grade school students of Mahatma Gandhi International School. He personally introduced San Marino to the students as the oldest republic in the world with a small land area and population, yet rich in culture with tourism as its main source of income. The consulate brought the students to San Marino through the stamps, coins, and other commemorative items displayed in the office. Ms. Viola Go-Clanor, consulate secretary, presented important facts about San Marino including its products, economy, population, founder, language, and people among others. Storytelling on the life of St. Marinus, founder of San Marino, and fun educational games capped their visit. Copyright © PJ LHUILLIER GROUP OF COMPANIES. All rights reserved.